Whatever it is that we personally want to achieve in any given year, it is a good idea to write down our aspirations in a similar manner one would write a Business Plan with Short Term, Medium Term and Long Term Goals. What are our objectives for the coming months? Where do we want to see ourselves by the end of the year? Where do we want to be? Who do we want to be more like? How do we want to look? We should also think long and hard about our Strengths and Weaknesses in relation to achieving our set Goals. Where do we normally excel and where do we typically fall flat on our face? What comes easy to us and what do we find difficult? What natural resources, talents or skills can we put to better use? What Personality Aspects do we need to channel in order to achieve our Goals? We should also write a Mission Statement for the year ahead after reviewing all our information. Like any Business Plan, our Personal Year Plan should be reviewed regularly and adjusted, modified or amended accordingly. We do have a tendency to think we can achieve more than we actually can. Things generally take longer than we allow for. Also, life can sometimes get in the way and throw curve balls at us that result in knocking us off our disciplined path and disturbing our equilibrium. After such times it can be difficult to settle back down and get back on track again. We shouldn’t beat ourselves up when this happen as we cannot make allowances for everything. I am sure you are familiar with the old saying ‘and so go the best laid plans’. We can only do our best, but should life get in the way throughout the year, just like when we have weak a moment, break our diet and binge eat, it does not mean that it is all over. It is important to pick ourselves up, dust ourselves down and continue from where we left off. We can still achieve some of our Goals by the end of the year. The rest can be carried forward into next year. The thing is to try our best. Below is a way of using The Tarot to determine what Goals we need to set at the beginning of any New Year. This is done by looking at each of the Four Suits which represent four areas or approaches to life. choosing Cards from each of these Suits we can build our Personal Year Plan. We must also look at the Court Cards in each Suit as they will represent the four aspects of our personality, which with a bit of work and a dose of courage can be adopted or channelled to achieve our aims. We may need to style ourselves on a Personality Type that is unfamiliar or uncomfortable to us. 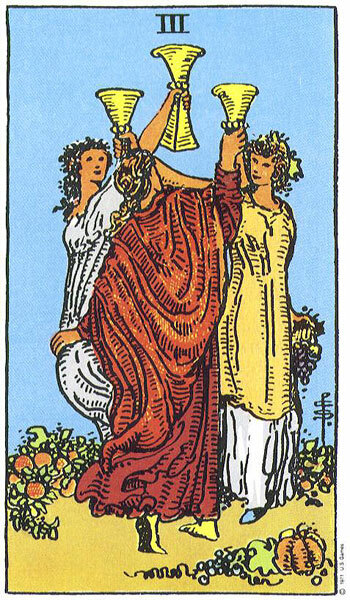 Basing this on just The Four Queens alone, it may be a case of having to step into The Queen of Wands shoes to become more assertive or independent, or perhaps The Queen of Cups to encourage us to be softer and more loving, or to stimulate our imagination and artistic abilities. We may choose The Queen of Swords to help us with mental discipline or communication, even speaking up for ourselves. 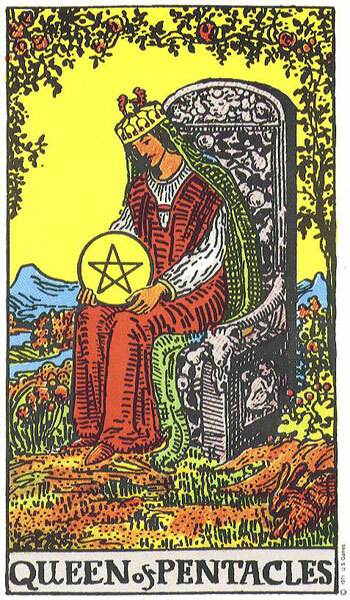 We may need to call on The Queen of Pentacles to make us more domesticated, nurturing, healthy, better at managing our finances or more business-like. We must then look to The Major Arcana for the powerful forces which will act as our Key Motivators to achieving our Goals. These will represent our Ultimate Objectives for the year ahead. These Cards can be viewed on a regular basis to determine how we are progressing. Do we feel closer or more connected to them as the months go on or do they seem as elusive as ever? Our aim must be to eventually meld into our chosen Major Arcana so that we are in a position to say ‘yes, this is me, this is I’. You need to feel suffused with the powerful energy of these Cards. Let these Ultimate Objective Cards be your Guiding Light throughout the Year. Lay out the Four Suits from Ace to Ten in a row and examine each Card closely to see which represents or reflects the Goal you wish to achieve in that area of your life. You can pick as many Cards as you like. Many will be inter-related and share certain commonalities. When you have done this for each Suit, sit back and review the Cards laid out in front of you. You may find that you have more Cards in certain Suits or that you have to struggle to find any Cards at all in a particular Suit. By analysing all the Cards you will begin to see where your priorities lie for the year ahead. You may discover that the most important thing for you this year is your relationship and personal happiness rather than career if Cups Cards seem to dominate. 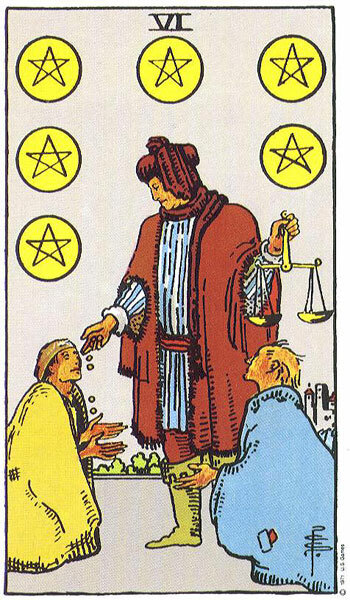 Then again, if you find that the Suit you chose most Cards from is Pentacles suggests that finances, career, health or business may be top of the list. 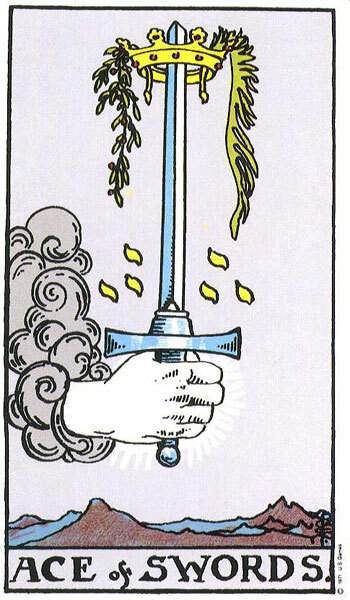 If most of your Cards come from the Swords Suit then you may be determined to tackle stressful issues or seek to develop new attitudes. You may also wish to spend the year planning your next move or seeking professional advice or possibly taking legal action. You may simply wish to broaden your mind through further education or by reading all those books that you have been talking about for so long. If Wands dominate then your Goals will be action related and possibly focussed on travel. You certainly will want things to happen this year and feel buoyed up with motivation and enthusiasm. Career may also figure strongly. So which area of your life are you focussing on the most and which area are you giving the least attention to? For the areas you are giving least attention to, ask yourself why this is? Is it that you feel stable and satisfied in those areas or are you deliberately ignoring them for one reason or another? Have you got loads of Cards in each Suit? Are you setting too many Goals for yourself? Will you realistically be able to achieve all? When you have done that, cross-reference your Cards using the Four Suits to examine how your Goals will affect each area of your life. If work and career dominate, how will it affect your relationship and family life? Across the Suits do you see any commonalities which would strengthen your resolve and ability to achieve your Goals? Which will have a knock on effect in other areas of your life? So let us do that now before we go any further. Here is a quick lay out I have done for myself for the Year 2014. I have just given brief examples to give you an idea of the way this Reading works. Three of Wands – Want my work to develop and for it to reach more and more people around the world. 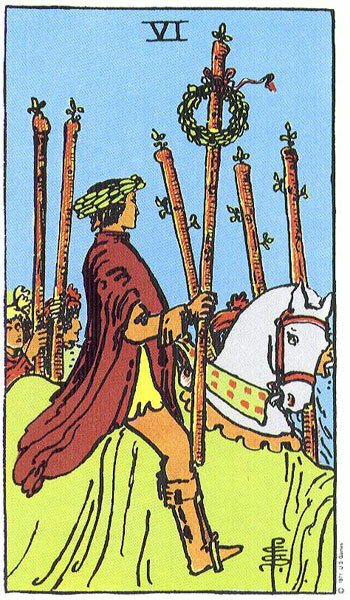 Four of Wands – This Goal is related to my Partner. He is exchanging contracts on a lovely home by the sea in West Cork, Ireland. It needs to be done up inside so the Goal here is to help him with all the interior décor so that it will feel like a real home. Can’t wait to go shopping !!!! We plan a subtle coastal theme throughout. It will also be great to welcome visitors. It would be wonderful to see all the work done by the end of the year. 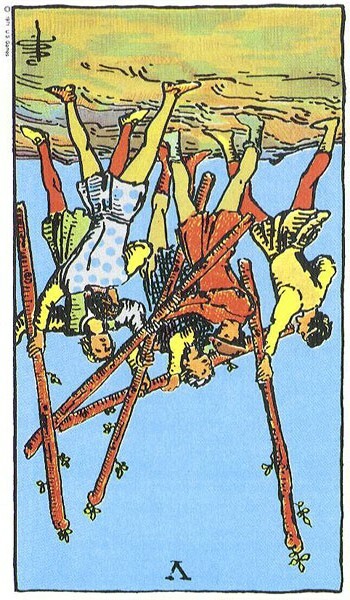 Five of Wands Reversed – To see everything come together instead of me being pulled in several directions. Trying to do so much at present and all screaming for attention. By the end of the year I want to have drawn a line under all the nitty-gritty stuff and feel less all over the place. 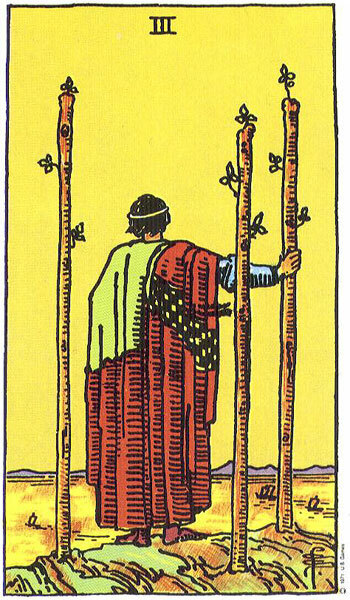 Six of Wands – I want to succeed in my Goals and feel successful in myself. Eight of Wands – I want to see my work really take off and some results for all the hard work and effort. I would actually like to take an overseas vacation at some stage. Ten of Wands Reversed – A bit like the Five of Wands Reversed, my Goal would be to lighten my workload as a result of completion of tasks in certain areas, thus allowing me time to rest. I aim to have sorted most of those ten wands by the end of the year and be closer to completing the bulk of my work. 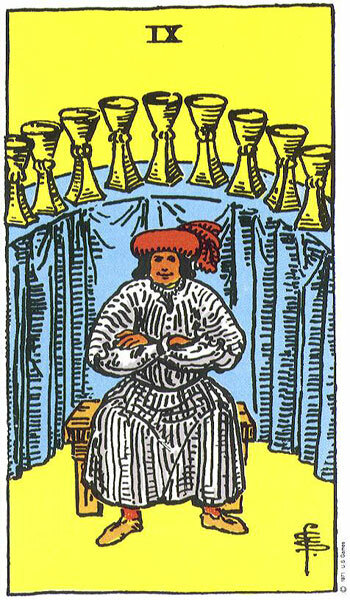 Three of Cups– Have to socialise more and meet up with friends and family. Also the Goal here is to celebrate the results of all my hard work. I will soon hit my 1,000,000 viewer and that certainly will be cause for celebration. However, my goal will then be reset for celebrating the next million within the year instead of the year and a half it took me to reach my first million. Pushing the bar higher and higher all the time. Nine of Cups – My wish or dream coming true. To feel really proud of myself and again further cause for celebration. Ten of Cups – This again is to do with the Goal of that dream house by the sea and spending as much time there as possible. Ace of Swords – Starting off as I mean to continue with a New Attitude and Mind Set. To focus on my writing. Four of Swords Reversed – Determined to stay out of hospital and not let myself get too stressed about things. Now that I am back on my feet again, I want to stay that way. Eight of Swords Reversed – To liberate myself from all the self-restricting and negative attitudes about myself. To become mentally stronger and believe in myself. Yes I can and I will. 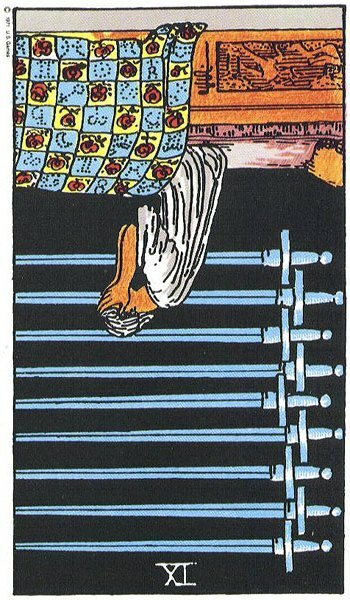 Nine of Swords Reversed – To free myself of stress and not let worries come between me and my sleep. To understand that the only thing worry and stress succeed in is making me unwell. 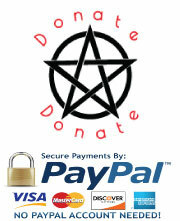 Ace of Pentacles – Good Healthy Start. My goal is to hold onto my physical strength and grow healthier by looking after myself better. Eat well, exercise plenty and also rest. This is going to be my year for seeking financial stability. Three of Pentacles – To build further on what I have already achieved. To set high standards for myself in all my work, both my writing and my doll making. To get back to my singing tuition as soon as I can. 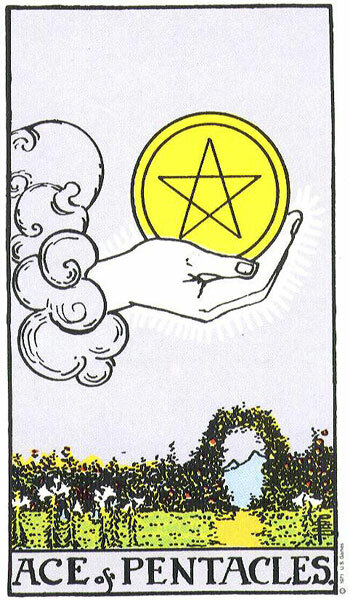 Four of Pentacles – To be able to hold onto some money and save. 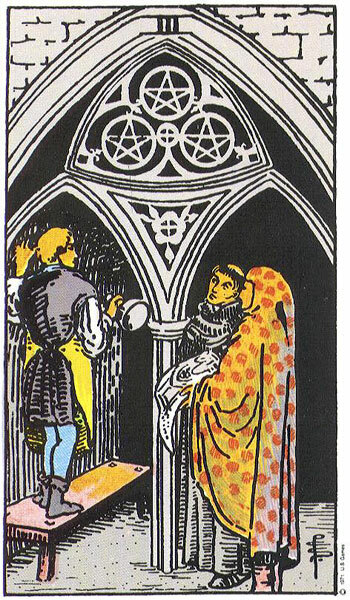 Five of Pentacles Reversed – To Say goodbye to ill-health. 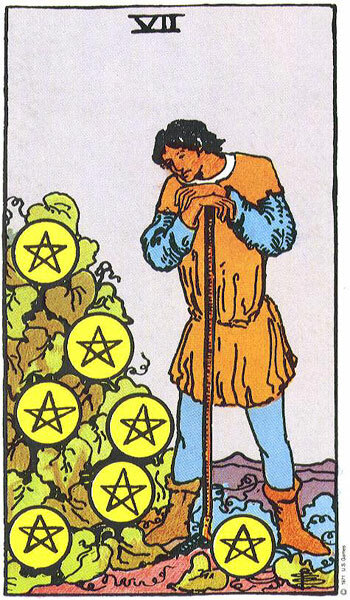 Six of Pentacles – To get paid for the work I do. To become active in fundraising for Cancer Charities. Seven of Pentacles – To take a bit of a break from constant work. To have enough work done that allows me to do so. Eight of Pentacles – To give the best of my best and to become professional at what I do. Nine of Pentacles – To at long last reap the benefits of all my hard work and effort. Must begin to see results. 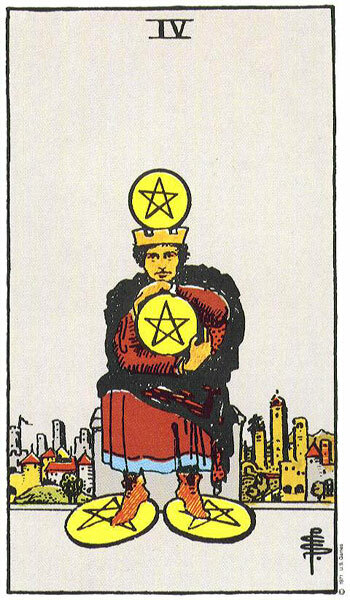 Ten of Pentacles – To be financially stable and secure. Three Aces – Showing the determination for fresh starts and pure potential for the year ahead. 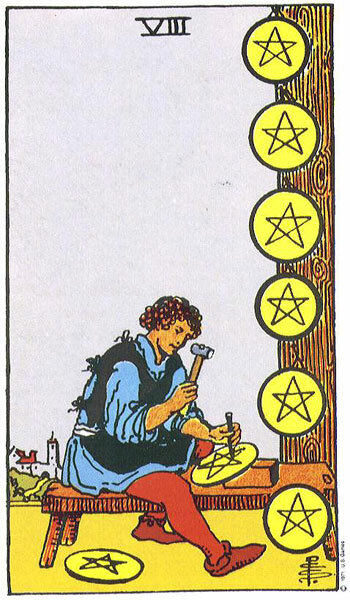 Three of Pentacles, Eight of Pentacles – Determination to keep working hard. 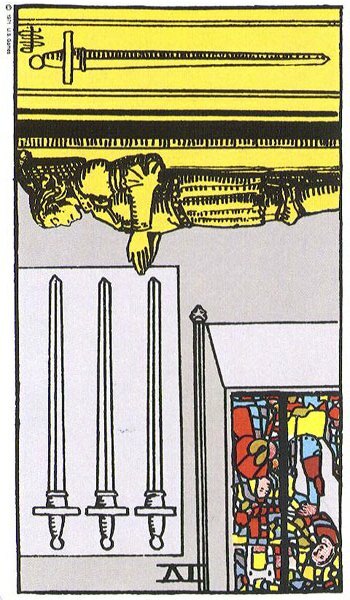 Five of Wands Reversed, Ten of Wands Reversed, Seven of Pentacles, Nine of Pentacles – Determination to complete work and tasks thus allowing more free time. 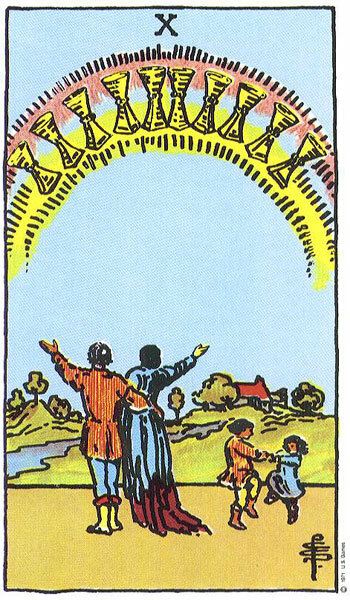 Four of Wands, Ten of Cups, Ten of Pentacles – Stability and happiness on the home front. Ace of Pentacles Four of Pentacles, Nine of Pentacles, Ten of Pentacles – Determined to find financial security. Ace of Pentacles, Ace of Wands, Four of Swords Reversed, Five of Pentacles Reversed, Eight of Wands – Determined to regain full health and get active again. Ace of Swords, Eight of Swords Reversed, Nine of Swords Reversed – Determined to deal with stress with a change of attitude and approach. By analysing my Cards it is easy to tell that my overall Goal is to see a result for all my hard and consistent work. It is obvious that this year I want to have the bulk of my work completed so that I can lift my head and take a bit of a breather. That means keeping going and doing what has to be done until it finally starts coming together. That might mean working 24/7 for some time to come. By working very hard now and not letting up, it is the only way I will achieve what I have set out to achieve. There is no short cut to where I am going, and in the Cards it is clear that this work can only be done by me. There is no option to delegate. If my Goal is also to be rewarded for my hard work then the effort put in will be worth it and this will have a knock on effect on my overall self-esteem and self-confidence as shown in my Cups Goals and Swords Goals. I must stay consistent in my work and not let it become shoddy or lack lustre. 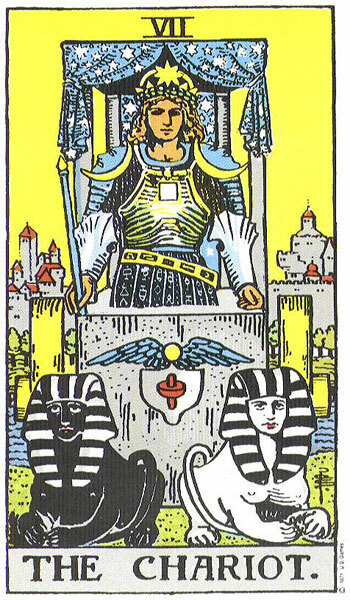 The dominating Suits are Pentacles and Wands which demonstrate the above. Hard work and effort bringing financial reward and personal success. The year can not be let go by without achieving this Goal in some shape or form. Without reward or recognition for one’s work, it is easy to lose heart and lose interest. The Swords Suit show quite clearly that my Goal in this area is to change any self-limiting or negative attitudes I may have about achieving success. I need to believe in myself more. This will probably one of the hardest Goals to achieve as it involves re-programming the mind and thought processes. Cups figure least in my Goals and I believe this is because I am happy in this area. However, the desire for inner happiness is demonstrated in the Nine of Cups which I think will fall into place if I achieve my Sword Goals. The Cups Cards also show my desire to socialise and celebrate. There are several other Cards that symbolically represent the desire to celebrate and I know that for me in 2014, failure is not an option. Therefore I plan on having many things to raise a glass to. Which Personality/Personalities do I need to bring to the forefront to help me achieve my Goals? – For me this has to be at least Three of The Queens, but possibly the whole Four as I need several things to come together to be in with a chance of realising my Goals. I have laid these out in order of Importance. Queen of Wands – I need her personality and drive to keep me enthused and motivated about what I am doing. She will help me keep my energy levels up and provide inspiration and momentum. 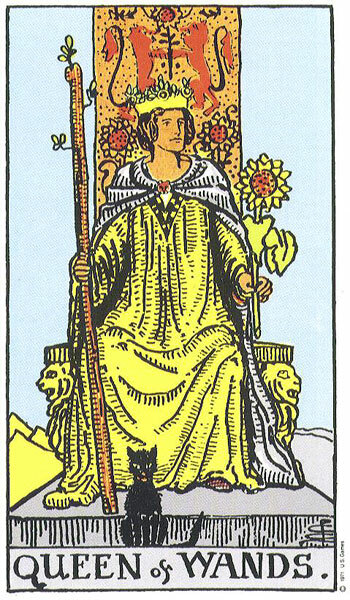 Note – The Queen of Wands is there with me most of the time for I would not have got this far without her. I do need her to help me remain positive and optimistic and to up-to-date with current trends. I need her to keep on the look out for me so that I do not become complacent. Queen of Swords and Queen of Cups – The two writers. 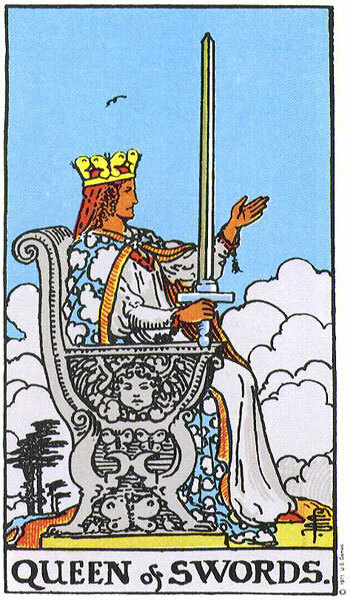 The Queen of Swords will help with the mental discipline it requires to sit down and write on a daily basis. She will also guide me with any factual matters I write about from an academic point of view. The Queen of Cups will provide the imagination and creativity for the story-telling, fictional and dramatic aspect of my writing. Note – I work with both of these Queen on a daily basis. The Queen of Swords is powerful in her influence over me being very disciplined in my work. She disregards any attempts at me shying off because I feel tired. She would keep me at my keyboard all day if she got the chance. She drives me in my writing and insists that I am thorough in my communication as a tutor. The Queen of Cups has helped me significantly with the story-telling aspects of my writing and has opened a whole new side I had not yet explored. She is also inspirational with her creative ideas for my doll-making. I love her, for without her influencing my imagination, everything would be stale and dull. 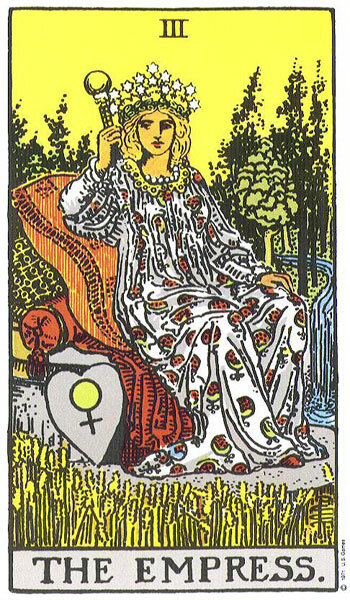 The Queen of Pentacles – The Business Woman. She will demand that I see a result for all my work and will help me develop the business and financial side of me which can only be set in motion after the three other Queens have done their work well. She will keep me grounded and practical in my approach to achieving my Goals. She understands my desire to work for myself. Note – Now here is a lady I have to get very familiar with and she may prove to be difficult. 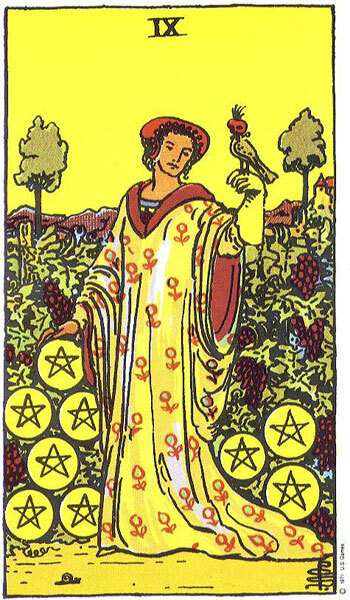 Do not get me wrong here for I have many of The Queen of Pentacles’ personality aspects. However, some of them leave me uncomfortable, and this comes down to her business side. Here I need her help for it does not come naturally to me. I will have to work closely with her in the coming months and take many leaves out her book so that I can feel more like her. After reviewing all the above Cards and analyses, which Major Arcana Card or Cards most closely symbolise or represent my Goal/s for 2014. These Seven Cards jumped out at me as I looked through all the Major Arcana. The World -Ultimate Success, the completion of work, Rewards, Global, Further Success, Inner Happiness, Achievements. The Magician – I have all the tools at my disposal. I just need a workable plan and make things happen for me. I am in a strong position. The High Priestess – The Guardian of Arcane Knowledge. It is all within my subconscious and can be shared with those who are prepared to listen and be patient.Keep cool, calm and do not get flustered. Feel my success within. The Star – Realisation of Potential, Utilising Gifts, Skills and Talents, Recognition, Following My Star, Vacation, Peace of Mind. 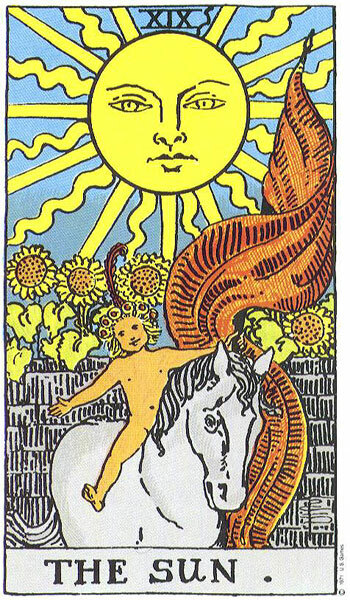 The Sun – Full Creative Expression, Success, Joy, Happiness, Freedom, Celebration, Health. The Empress – Inner contentment and Happiness, Feeling good and Feeling Healthy, Creativity, Plans Maturing, Growth, Abundance, Self-Nurturing, Luxuries, Pampering, Working from Home, Singing, Arts and Crafts, Domestic Bliss. This is a wonderful and inspiring post. I wish you well with all of your goals, especially, as they say, your health and wealth. I know you will achieve great things and I promise to be with you to help and support you on your path. Reading this has inspired me to set an immediate short term goal for myself, namely to pull my cards and do as you have done ! Time is finite and can easily get frittered away, lost and wasted on nothings. Already I can see that a major goal I will have will be to make good use of my time both personally and with you. We have both been through a lot of hardship over the past number of years but Spring and new life is not far away and we have much to look forward to and to achieve. I raise a toast to health happiness anf our New Year …ttogether ! Thank you for your endless support and patience and having to just watch my back all the time as I work on the computer. It must be very boring for you. I’m 56 and have used the Queen of Wands as my significator since my first reading at 13 when I bought the deck I still own and use. I say this not to boast but because I want you to know it means a lot that I’ve learned more and deeper from your site than I have from all the years in between. I also know that reading for yourself can be tricky- I sometimes have a hard time seeing the other side of my shadow. What I say next is sooo presumptuous, but I think you have failed to see a large part of the pattern. Only 10 of the cards you indicated, and particularly those dealing with possible health issues, are of a single person. It appears to me that what you are responsible for on your own is your health habits. 9 of these cards feature two or more people, primarily in emotional and business aspects. 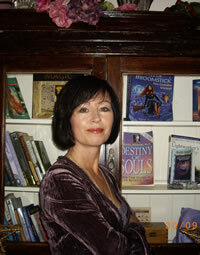 You are an amazing writer and thinker and psychic. It’s not reasonable to expect you will also be an amazing business person. The 3,5, and 10 of pentacles is telling you to seek refuge and sanctuary and support for your work. The seven isn’t telling you work 24/7 but to rest and review and figure out where to market the harvest. I believe the cards are telling you to get a business manager. 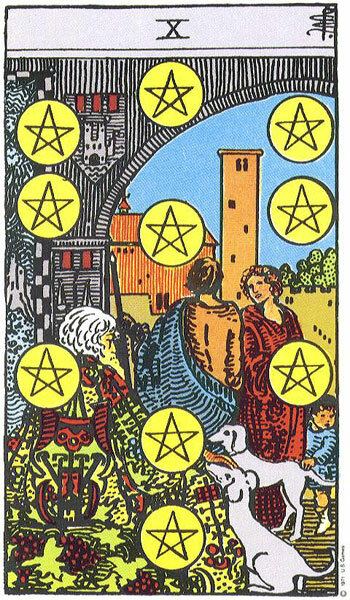 The four of pentacles is a warning that you may not be happy with what they suggest. Don’t clutch too tightly to control or the ‘right’ way to do everything. 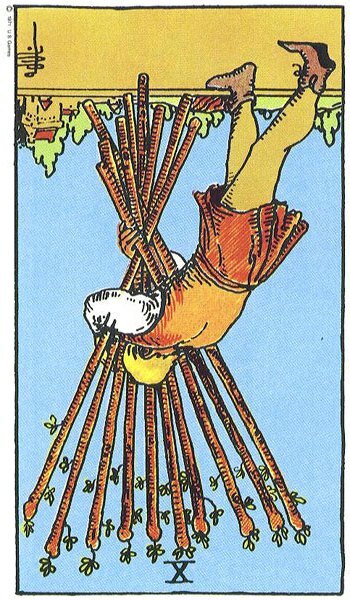 The 5,8, and 10 of wands all suggest that you must cooperate, let loose of your work and give up your burdens in order to succeed. 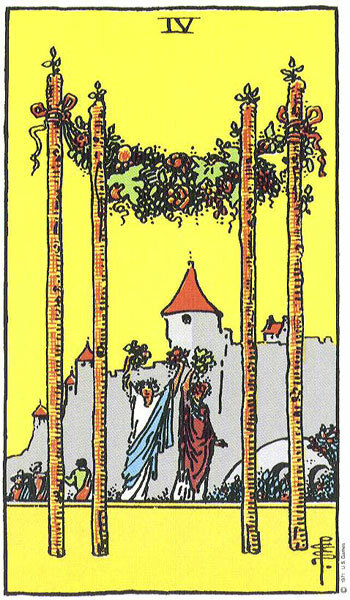 Even The Empress and the 9 of Wands suggest that it takes an organization to create a triumph. What if The Empress tried to do her own bookkeeping? Of course she could, but would it leave her time to order her empire the best that she could? And Alexander the Great didn’t conquer the world by himself, he did it by inspiring an army. A good friend told me my motto ought to be, “Occasionally wrong, NEVER in doubt” 🙂 so take this with a grain of salt. Keep up the good work, thanks for a wonderful site I’ll be be back to over and over. So sorry for the delay in responding. Am recovering from major surgery and also have started college, so hence very little time. Thank you for your lovely comments about my site. They are much appreciated. With regards, the Reading you refer to, the Cards were not drawn. I deliberately picked them to reflect my goals for the year ahead. This is very much a teaching exercise so that the students can learn to map out a story using the Cards, their imagery and associations. These cards I selected to represent my Goals and Objectives for 2014 and the aspects of my personality I would need to bring to the forefront to achieve them. I did not intend it as a Tarot Reading and later this month will be re-visiting it as part of an exercise to take a look, at my Personal Plan, to see how much I achieved, how much still has to be done and also any adjustments that need to be made after lessons learned throughout the year (I may do a Reading for insight into why certain Goals were not reached etc). It is intended to be like a business plan or New Year’s resolution but not as a personal reading. You appear to have used this Business Plan to do a reading for me. Thank you very much. I deliberately chose the Four of Pentacles to represent my need to consolidate my finances. The Five of Pentacles was chosen to represent the need to overcome my health issues, that yes, are my problem because I was born with some genetic issues. My recent surgery has resulted in me now having a bag. I knew this surgery was going to happen in 2014. I had to decide to go ahead with it so it was a personal choice. 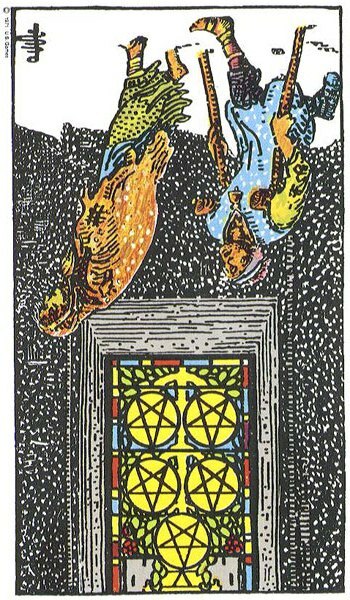 However I knew this radical surgery would improve the quality of my life, thus the choice of the Reversed 5 of Pentacles (breaking free of ill health) to represent this. I chose the Three of Pentacles to represent the college I wanted to attend once my surgery was complete and I am now a month into it. The Ten of Pentacles was chosen to represent not only the desire for financial security but also being able set up a business. The Seven of Pentacles I chose to highlight the need for me to take some rest or a break. Much has been done, more to do, but that I am closer to the finish line now. The break will give me time to reflect on where I am going to. The Reversed Five and Ten of Wands were chosen to represent my desire to offload some of the burden and to get to the stage where I would be able to focus on key areas and not dissipate or dilute my energies. I wanted the uphill struggle to cease so that I would be more free in myself. 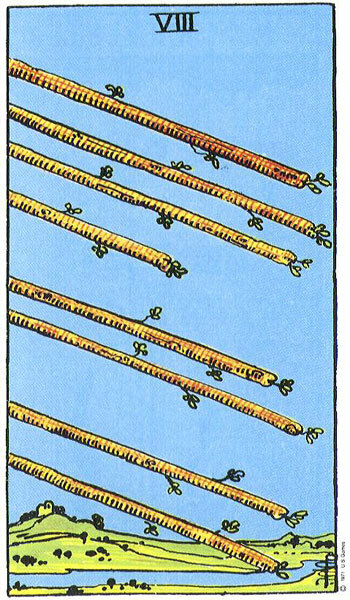 Therefore, the Eight of Wands was selected to reflect my desire to be freed up and to see all that I have set in motion begin to take off for me. I also wanted to experience some energy if my surgery was successful. The surgery has been a long time coming and has weighed me down. I won’t go through the rest of the cards as my explanation demonstrates the nature of the play of cards in this instance and not as a reading.